Meet Border Patrol’s two newest enforcers – Lester and Lugo. 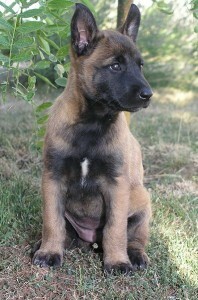 The 4-month-old Belgian Malinois dogs arrived at the Yuma Sector K-9 unit this week, Yuma News Now reports. “Canines have been used in the Border Patrol as far back as the 1950s, but the current Yuma program started in 1986 with four teams and has grown to more than 60. With these teams, we can cover much more ground,” Special Operations Supervisor (SOS) Wes Burch said. Lester and Lugo will replace two retiring dogs. The dogs will be trained to search for people, weapons and drugs. Posted: 5/28/14 at 9:07 AM under News Story.